Explore the English Riviera's 400 million year history and see the UK's first resort in a different light! You will discover a landscape untouched by glaciation, revealing stories unseen elsewhere in the world. Stories of tropical seas and scorching deserts, raised beaches and drowned forests, hippopotami and mammoth, straight-tusked elephant and sabre toothed tiger, cave bear and earliest man. to understand our dynamic planet and how it has shaped our local environment. The English Riviera is working to join the family of 50 Global Geoparks, a UNESCO network. Below are just three sites that you may wish to visit to begin to understand the fascinating geological story of Torbay, the English Riviera and to discover that our first human visitors were the hunters that settled here around half a million years ago. VisitBerry Head Country Park and you will be standing 60m (200ft) above sea level on the remains of a massive coral reef. This reef formed at a time in the Earth's history around 400 million years ago when, thanks to the movement of continental plates, our landscape was a few degrees south of the Equator. As a result the sea was warm, tropically warm, and primitive corals were able to thrive, along with many other creatures that are now extinct such as trilobites and ammonites. The corals and these other creatures, like their modern-day relatives, fixed calcium from the seawater to construct their shells - and when they died new corals grew on top of them. Over hundreds of thousands of years, immense underwater reefs were formed and the calcium carbonate was compressed into solid rock. Changes in sea level and the further effects of continental drift have left the resulting limestone exposed to the elements. Tor Bay is framed by the tough, pale limestone headlands of Berry Head in the south and Hope's Nose in the north. In between the picture is confused, but most of the rocks are New Red Sandstones, aged around 280 million years. These rocks are much softer than the limestones and the sea has eroded them over the millennia to a much greater extent - creating the crescent of the Bay. 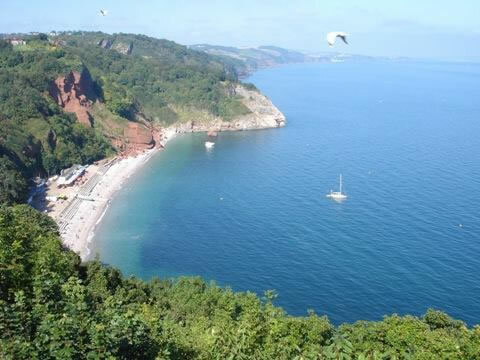 From Babbacombe Downs the view stretches many miles across Lyme Bay. Red sandstones take you as far as Budleigh Salterton in East Devon and then into the haze the younger cliffs of the Jurassic and Cretaceous Period extend towards Portland. At Babbacombe Downs the limestone cliffs are actually upside down compared to the time of their formation. So how did it happen? Around 300 million years ago there were only two huge continents on planet Earth. Plate tectonic movements caused those two continents to "crash" and, over many millions of years, intense pressures squeezed all the sediments that had been laid down in the Devonian, piling them up to form a vast mountain chain. On a local scale this major episode in the earth's history had a fundamental effect on the rocks of Torbay. Sediments were folded and fractured as they were crumpled and pushed northwards by the collision and on Babbacombe Downs the pressure was so great that a large fold was turned over on itself literally turning the sediments upside down. The dark slates at the bottom of the cliff are actually younger than the pale limestones of the Downs at the top! Here in the middle of the horseshoe bay that shapes the English Riviera, the land is made of the softer red sandstones which erode far more easily. In the past, the view from this point would have been very different. Travel back 280 million years and you would be in the sweltering intense heat of an arid desert that covered most of Britain and Europe. 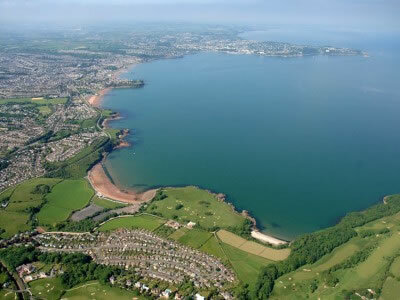 Thanks to the movement of continental plates, Torbay lay around 150 to 300 north of the equator. At that time Paignton lay in a broad depression surrounded by mountainous ridges of limestone and slates. Occasional but violent storms caused flash floods to sweep rocks and stones down the desert valley out onto the plains where the water sank into the parched rocky ground. The rocks and stones were deposited creating the very jumbled, fruitcake-looking rock known as Breccia, found at the end of Goodrington Promenade. In these arid conditions irons within the rocks were oxidized, turning them red. Very little seems to have been able to survive in these Permian deserts, although between Goodrington and Saltern Cove strange fossilised burrows up to 10 cm across, in the stony deposits, may have been the home of giant centipede like creatures. Visit the Seashore Centre at Goodrington to find out more about this areas geopark features and events taking place. Just imagine the English Riviera echoing to the sounds of sabre toothed cat and mammoth, whilst in the caves, sounds of early man would have been all around you. Perhaps the crackle of a fire, the cry of a baby, along with the noise of flint knapping as a new hand axe was made. Dating of bones and worked flint tools discovered in Kents Cavern provides evidence that the caves were home to Britain's first humans. A jawbone on display at Torquay Museum is 38-40,000 years old and scientists are currently determining if the bone is early modern human, Homo Sapiens or Neanderthal. melt, the Channel flooded and these hunter gatherers became permanently cut off from Europe. 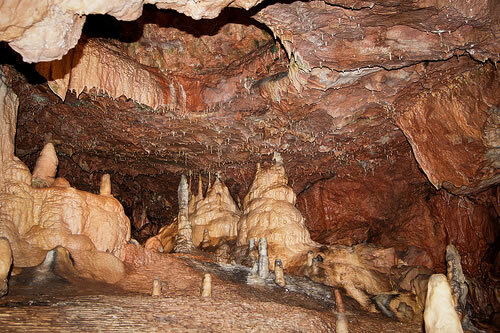 Although deceptively reddish brown in colour, due to high levels of iron oxide, the rock in that has formed this cave system is limestone, shaped into caverns with stalagmites and stalactites formed over millions of years. We invite you to enjoy the beaches, swim in the seas but also to think of the fascinating heritage.